Gertrude Bell was a British writer, archaeologist, and political officer known for helping to establish modern Iraq after World War I. Bell spent a lot of her time reading novels like Alice in Wonderland and The Tales of Ali Baba, leading her parents to send her to continue her education at Queen’s College in London and then at Oxford (Goodman, 9). Gertrude Bell lived a full life and was a very influential woman in the 20th century, earning many titles such as the First Woman to receive highest honors in Modern History at Oxford; first person to climb all of the peaks of the Engelhorner range in the Swiss Alps, one of which is named “Gertrude’s Peak”; first woman to do a solo journey into the uncharted Arabian desert; and the first female Intelligence officer employed by the British Military (Chandler). Gertrude Bell was born on July 14, 1868 in a small village of Washington in County Durham in England. She was born into a family of wealth that was quickly rising. During her childhood, her father added two properties to their estate, but Gertrude grew up in Redcar, a Yorkshire town, in a home built by her father (Goodman, 3). Her mother died when she was two years old when she caught pneumonia after she gave birth to Gertrude’s younger brother, Maurice. Gertrude’s father soon after married a woman named Florence, who was “highly cultured and accomplished; a respected playwright and always regarded as a ‘perfect lady’ by Victorian society” (Goodman, 4). Florence became very close to Gertrude as time went on and introduced her to many novels that drove Gertrude’s intellect. In the 1880s, it was still very unusual for an upper-middle class family to send a daughter away for schooling. However, her father and Florence sent her to an all-schools girl, Queen’s College, when she was sixteen. Gertrude never considered herself as “one of the girls” and missed having her male companions around when she was at school. After she finished her time at Queen’s College, Bell wanted to continue her education. She started her time at Lady Margaret Hall in Oxford in 1886. There, she fell in love with the subject of modern history. Her parents’ decision to allow Gertrude to continue at Oxford “revealed them as a highly enlightened family” (Goodman, 10). Her love for education and her thirst for new knowledge made others remember her as “the most brilliant creature who ever came amongst [them]” (Goodman, 12). She spent five terms at Oxford, instead of the typical nine, and afterwards she was the first woman to receive highest honors in Modern History at Oxford on her oral exams (Chandler). As Gertrude continued her studies at Oxford, and long after, she was highly interested in Persia and its language, and Arabic. Gertrude dated multiple men and fell in love only twice, but never married either of them. She spent much of her time reading, exploring and excavating archaeological sites, and helping establish what we now see as Iraq. Not only was Gertrude interested in archaeology, she was also very interested in climbing mountains. Bell was interested in “doing it the way she did everything else: not by following in other people’s footsteps, but by seeking to break new ground” (Wallach, 62). She started at Oberland (10,485 feet) in Switzerland, then continued to Finsteraarhorn, which had a 3000 foot vertical incline, steeper and higher than any other place in the Alps. She was the first person to explore systematically the peaks of the Engelhorner group (Wallach, 63). Between 1899 and 1902, she climbed several peaks in the Alps and became one of the most respected female climbers of all time and one of her newly conquered peaks was named Gertrude’s Peak after her achievement (Newcastle University). Along with being an adventurer, Gertrude Bell was highly involved with politics and women’s suffrage. Her father was a Liberal Member of Parliament for the Hartlepools that sparked Bells’ interest in politics when she was young. Over time, she showed “political acuity and a firm allegiance to the Liberal Party” (Goodman, 8). Bell opposed women’s suffrage and was a founding member of the Women’s National Anti-Suffrage League where she vigorously opposed the woman’s right-to-vote campaign. She believed women could not handle the stress and content of higher education because women were not as physically, mentally, and emotionally strong as men were. She “held a very low opinion of the majority of women, even when they were her social equals… and was conspicuously intolerant of the wives of her colleagues” (Goodman, 49). Gertrude Bell had many passions in the areas of academics, politics, and exploring, but her heart rested in the field of archaeology. Her interest in the Middle East sparked when she visited Persia and Iraq after her graduation from Oxford. She had an 8-month stay in Persia and extensive trips throughout Europe, Asia Minor, and northern Africa through her lifetime. Seeds of archaeology were “planted in her mind” when she watched David Hogarth work at a dig, extract vessels from the Earth, and then when she met a colleague who planned to recreate the ancient world from his excavations (Wallach, 43). She worked with multiple archaeologists such as David Hogarth and Sir William Ramsey on multiple projects and sites. Her archaeological explorations and findings led to her writing of multiple books such as, Syria: The Desert and The Sown, Amurath to Amurath, The Arab of Mesopotamia, and many academic journals and reports. Gertrude Bell is well known for her travels in the Middle East in the earlier 20th century. Her archaeological excavations helped her gain knowledge of the geography and politics of Mesopotamia, which eventually helped her in the creation of the state of Iraq. Bell worked with many leading archaeologists in the Middle East and wanted to preserve the heritage of Iraq. Much of her time on sites was spent recording the sites she visited with photographs, drawings, plans, and descriptions. Bell never held a professional position nor directed others in excavation, but she did a lot of exploring on her own or with other archaeologists and her publications were held at a higher standard for many years. Throughout her explorations, she made significant contributions “to understanding the material culture of the ancient Near East, particularly the architecture of the Byzantine and early Islamic periods” (Cooper). David Hogarth introduced her to her first real excavation in archaeology. Hogarth’s work was from the island of Melos where he discovered pottery from thousands of years old. She then was introduced to Wilhelm Dörpfeld who showed her excavations around Athens. In a letter to her mom, she exclaimed, “Doesn’t [archaeology] make one’s brain reel?” (Cooper). Her first journey was to the Levant, where she travelled extensively from "Jerusalem up through the region of Jebel Druze around the border between Syria and Jordan, and onto the Damascus and Aleppo” (Cooper). As she was traveling, she started learning under the direction of Saloman Reinach, a French archaeologist, who was “primarily responsible for the popular notion that civilization began in the East” (Wallach, 69). His teachings sparked her interest in Egyptian, Roman, Greek, and Byzantine art and architecture. Her desire for antiquities came from these teachings also, which would lead to many more of her contributions to archaeology and motivation for her passion of preserving heritage. Upon her arrival from the Levant in 1905, she stopped in Anatolia, which is now present-day Turkey, where she visited “The Thousand and One Churches” or “Binbirkilise” on a ruined site near Konya. She and Sir William Ramsey, a British epigraphist and archaeologist, worked together to excavate the site. Although most of their work was based on the Byzantine ruins, they also discovered Hittite finds unexpectedly. These findings were published in The Proceedings of the Society for Biblical Archaeology by A.H. Sayce (Goodman, 40). Soon after, Bell and Ramsey decided to write a novel, The Thousand & One Churches, to be published in 1909. Bell was responsible for two of the four chapters and used photos and close descriptions to provide an accurate representation of the churches. While she was excavating this site, she also published her results in a letter to the Revue Archéologique (Goodman, 38). David Hogarth published a book, The Penetration of Arabia. When Bell discovered this book, she yearned to discover the unknown desert in Arabia that Hogarth wrote about. The “time was not yet ripe” to do so, so she planned a different journey (Wallach, 69). Gertrude Bell always lived in a way where she wanted to be different from everyone else and explore places that no one ever had. She lived her archaeological career the same way. After Anatolia, she “hoped to visit and describe sites for which little had been systematically documented, so that she could test her archaeological training” (Cooper). She continued down the Arab lands of the Near East for more than 2400 kilometers. On her list of cities were Babylon, Ctesiphon, Baghdad, Samarra, and Assur. It is said that the highlights of her trip were when she visited Babylon and Assur because she met German archaeologists that were uncovering important ancient remains. In Babylon and Assur, she met Robert Koldewey and Walter Andrae, two very influential people in her growing love for Mesopotamia and its rich antiquity, respect for the country’s antiquities, and up-to-date, scientific methods of excavation (Cooper). She observed both Koldewey and Andrae exposing multiple buildings in each place such as the “massive brick palace of Nebuchadnezzar” (great Babylonian king of the sixth century BC), the Ishtar Gate, a ceremonial entrance to the great city, and many Assyrian buildings that Andrae wanted to recreate for the kings, priests, and armies (Cooper). Through all of her findings, she hoped to combine all of her material—“the archaeological and the anthropological, the social and the cultural, the ancient and the modern, along with the dozens of photographs” and write a book (Wallach, 69). Her greatest adventure during Mesopotamia was through the Palace of Ukhaidir. Ukhaidir stood as a ruined palace in the desert wastes. She was not very knowledgeable about Ukhaidir when she first travelled there, but that was one of the many reasons why it was so important to her. Ukhaidir was first occupied in the early Islamic period of the eighth century, and in 1909, when Bell arrived, it was still preserved quite well. She took many photographs of the corridors, archways, courtyards and grand halls, measured walls and rooms, and produced a comprehensive plan of the complex and surrounding fortifications. Although she wanted to be the first one to publish a journal or book on the findings of Ukhaidir, Frenchman Louis Massignon, visited the castle in 1908 and had already published his findings. His findings were very brief, but in 1912, the German crew from Babylon published their findings that were “masterful in careful description and detailed archaeological drawings” (Cooper). Bell also participated in smaller excursions, such as in Burqa, Syria, where she found evidence of Roman occupation, took rubbings of Greek, Safaitic, and Kufic inscriptions, measured and planned out the ancient fortress, and reconstructed it from the rocks that remained (Wallach, 110). She also made a venture on the Euphrates, west to Nasariyah, to visit the mounds of Ur. Railway engineers and army generals were threatening the ancient lands and she wanted to protect the site and gather information before destruction (Wallach, 185). Her last excursion was to Ur, an ancient Sumerian city that had flourished nearly 6000 years earlier, as the honorary Director of Archaeology. She worked with archaeologists from Chicago’s Field Museum and the University of Pennsylvania. She said it was the “most thrilling sensation she’s had in archaeology” (Wallach, 349). Excavating the city revealed many aspects of the past life such as the staggered staircases (ziggurats), canoes that were made to cross marshes, golden statuettes and headdresses, golden daggers, copper vases, and cuneiform tablets. 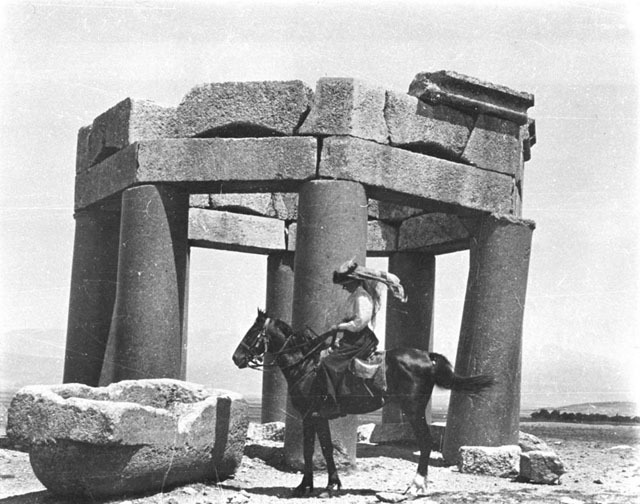 Gertrude Bell had multiple contributions to the field of archaeology, mostly through her writings and publications. Her main goal was to “inform the English of the ways of the East. She would tell them about the Arab world and its culture” to “establish her reputation as both a writer and a scholar… and a Person” (Wallach, 70). Her careful attention to detail made her writings reliable and accurate. She even returned (or attempted to) to many of her sites to double check and attain new measurements on her sites. Her first novel, Syria: The Desert and the Sown, published in 1907, was the outcome of her first journey to the Levant. When this book was published, Gertrude established herself as a person in Syria, Arabia, Mesopotamia, Turkey—and most importantly, England. This book gave Bell’s perspective travelogue, descriptions of the landscapes and her encounters with those who lived there, and gave insight to the first reflections on the ancient monuments (Cooper). Her first novel led into the rest of her publications. Her findings with Sir William Ramsey led to the publication of The Thousand & One Churches. It was published in 1909 and is “hailed as a classic of early Byzantine studies” (Goodman, 39). Bell’s keen eye for detail helped her tremendously while writing this book. She classified each church and described it in depth, technically and historically, and provided many photographs of each one. Her photos of Binbirkilise are among the best records (Cooper). Not only were the Byzantine ruins excavated, Bell and Ramsey also found Hittite remains. Even today, the sites still have unknowns to them. The Hittite sites were set up by a ruler called Haraptus, but when he ruled and who he was is still a mystery (Goodman, 39). Her third novel, Amurath to Amurath, was published after her 2400 kilometer journey through many countries. This book was published in 1911 and is a book “full of careful descriptions, plans, and photographs of ancient sites and perceptive suppositions about [the sites] dates and identity” (Cooper). This excursion and novel stressed the importance of bringing cameras and taking detailed photographs at all sites. After this, Bell always carried two cameras with her to ensure maximum accuracy of pictures and details. Her findings in Ukhaidir are arguably some of the most important findings to her archaeology career. She published an important monograph on the Early Islamic Palace and Mosque at Ukhaidir in 1914 (Newcastle University). Although she was not the first to visit the sites and record their findings, she was the first to “ascertain the correct date of Ukhaidir on the basis of its architectural characteristics and comparisons to other known Sasanian and Early Islamic period constructions” and “identify the unique arrangement of open court and arcades in the northwestern corner of the palace as a mosque” which further confirmed the date of the building (Cooper). Gertrude’s keen eye to detail and in-depth recordings helped her gain wider context of the buildings in Near Eastern developments at this site as well. Her findings were published in her book about Ukhaidir, in many articles, book reviews for The Times and academic journals on archaeology (Wallach, 95). Bell could have made archaeology her sole occupation for the rest of her life, but she “did not have the temperament to confine herself to academic pursuits” (Goodman, 43). She used her social class and personality to gain personal ties to many of the tribal leaders around Mesopotamia, Arabia, and Turkey that allowed her into many deserts and sites to excavate. This was crucial for her future additions to many archaeological journals and periodicals, which helped her gain many honorary positions in the field of archaeology. The people of Iraq called her “Al Khatun” which referred to a noble woman who earned respect, gave her credit for the professional standards in archaeology in Mesopotamia and allowed her to direct the Iraqi Antiquities Service under the British (Colorado State University). Her goal was always to preserve the heritage of Iraq and their culture which drove her to opening the Iraq National Museum in Baghdad and created an antiquities legislation regulating the excavation and export of Iraq’s archaeological treasures. Her Law on Antiquities “formally established Iraq’s control over its vast archaeological treasures” (Chandler). Under her, archaeologists excavating in Iraq “were compelled to adopt rigorous standards” and “excavation permits limited archaeologists to work only at a single location” (Colorado State University). This law also allowed for “a fifty-fifty share of discovered treasures between Iraq and the archaeologists” (Goodman, 108). Most findings discovered after this law were kept in the museum she helped build up that was opened in 1926. Gertrude Bell’s legacy lives on through her archaeological writings. Her additional writings in regards to Persian and Arabic poetry are also critically-acclaimed as “a source of mystical inspiration and is used, even today, for divination” (Goodman, 15). Her photographs and discoveries are seen as some of the best discoveries and findings of all time. Her true legacy lives on through the Iraq National Museum in Baghdad that was founded in 1926. She devoted a lot of her time to this museum, by collecting ancient artifacts that “gave credence for her dreams for a grand Iraq” (Wallach, 355). The museum has traditionally exhibited collections featuring the 5,000 year long history in 28 galleries. The museum was closed in 1991 and reopened in 2000, but in 2003 suffered from a looting attack where over 15,000 collection items were stolen. These items included jars, vessels, and pottery shards. Only 3,000 have been recovered and since this, the museum has received protection and more security. The Iraq National Museum receives many undocumented artifacts that are often confiscated at Border Control because many people try to loot at archaeological sites, despite Gertrude’s efforts written in her Laws of Antiquities. Unfortunately, not everyone can be stopped and looting is still a major problem. The National Museum collections consist mainly of man-made objects and are from “Sumerian, Akkadian, Assyrian, Babylonian, and Islamic cultures and including objects made of glass, pottery, metal, ivory, and parchment” (The Iraq Museum). Bell wanted to open this museum because “the more proof she had of the achievements of the early Mesopotamians, the more she could substantiate her claims that Iraq would return to its former greatness” (Wallach, 355). Bell aspired to be great and everything around her to be great. 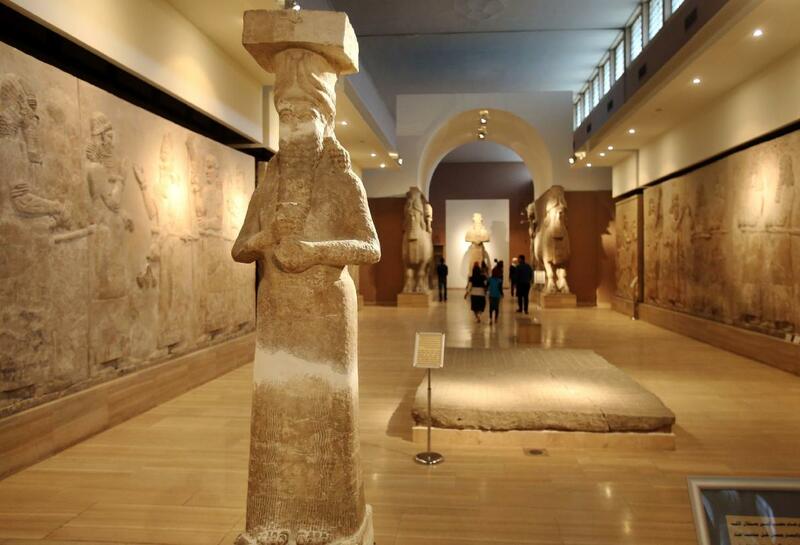 The Iraq National Museum is known to be “one of the great antiquities museums in the world” (Wallach, 374). Bell spent her entire archaeological career funding her own projects and excursions, just so she could be recognized by men and the people of her country. She became well established in not only England, but in Arabia, Mesopotamia, and what is now Iraq. Bell’s name lives on academically, archaeologically, and politically as she achieved many firsts in all categories. Her name will forever live in greatness because of her drive, passion for knowledge, and desire to retain the culture and greatness of Iraq. Biography.com Editors. "Gertrude Bell." Biography.com. A&E Networks Television, n.d. Web. 20 Apr. 2016. .
Cooper, Lisa. "Gertrude Bell and the Archaeoloy of Mesopotamia." British Archaeology (2014): 38-41. Independent.academia.edu. Web. 20 Apr. 2016. Wallach, Janet. Desert Queen: The Extraordinary Life of Gertrude Bell, Adventurer, Adviser to Kings, Ally of Lawrence of Arabia. New York: Anchor Edition, 1999. Print. Chandler, Elizabeth. "Gertrude Bell, Queen of the Desert | Amazing Women In History." Amazing Women In History. N.p., 2014. Web. 22 Apr. 2016. .
"Rediscovering the Past: Two Centuries of Archaeology in Iraq." Cultural Property Training Resource for Iraq. US Department of Defense, Colorado State University, n.d. Web. 25 Apr. 2016. .
"Newcastle University." Archaeologist; Gertrude Bell;. Newcastle University, 2016. Web. 20 Apr. 2016. .
"About the Museum." The Iraq Museum. State Board of Antiquties & Heritage, 2009. Web. 21 Apr. 2016. .
Goodman, Susan. 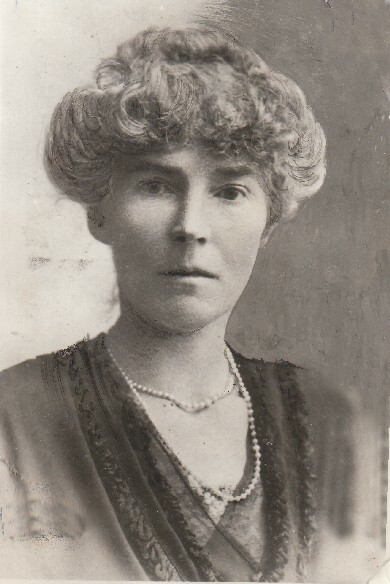 Gertrude Bell. Leamington Spa: Berg, 1985. Print. Selwood, Dominic. Digital image. 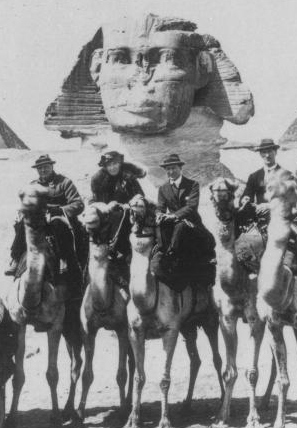 Gertrude Bell - Explorer, Archaeologist, Diplomat, and Spy. Dominic Selwood, 15 Feb. 2013. Web. 21 Apr. 2016. Kadim, Karim. N.d. Iraq National Museum, Baghdad. National Geographic. Web. 20 Apr. 2016.